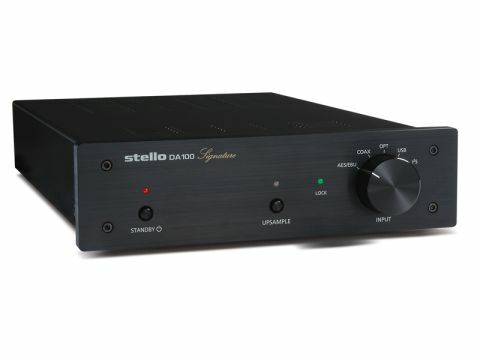 Stello is a brand of April Music, a Korean manufacturer of distinctive audio electronics. The distinctiveness is felt not just in the looks, but also in the features: this is just about the only DAC we can think of with an I2S input. Matched – surprise, surprise – by a Stello CD transport, this is in fact an industry-standard interface, but is normally used within equipment (on circuit boards rather than between boxes). Its great advantage over the usual serial interfaces is that it carries clock signals separately from data, which should, in principle, make jitter less of a problem. But then jitter has been shown to be a soluble problem, so it's arguably an interesting irrelevance. Other features are less remarkable but make up an attractive set, with all four of the usual digital interfaces on offer. Audio outputs come in both unbalanced and balanced flavours, while optional upsampling is offered to 96kHz or 192kHz. Internal appointments are good too, the digital receiver, upsampling and DAC chips all being recent parts of high-specification, while analogue components are through-hole types and include dedicated balanced line drivers and a Class A mini-power amplifier. The power supply is generous in capacity and well regulated (and runs surprisingly warm, even in standby) and all things considered, this is quite a lot of kit for the money. It's enclosed in a sturdy case and the front panel controls feel good to the touch (there's no remote available). So we weren't able to try one of the connection options and only had one transport available with AES/EBU – that still leaves plenty to experiment with. The good news is that the DA100 is not particularly fussy about which connection system one uses and, indeed, when we fed it from a laptop computer (first direct via USB and then interposing a USB-S/PDIF and jitter-reduction unit) and then compared that with a good-quality CD transport feeding the same datastream, we were hard-pressed to hear a difference. We felt the CD gave a slightly purer sound, a little sweeter in the treble, but the difference was not the sort of thing one would get hugely excited about. The bad news... well, there doesn't really seem to be any. That said, this isn't the perfect audio component and it does have more than a trace of character, which means it won't be everyone's cup of tea. It is fundamentally honest, we've no doubts about that, but it seems to add just a little 'zing' of its own to recordings. At first, that seems highly attractive and under any circumstances it's arguably very much preferable to the opposite, but it does mean that recordings that are already pretty lively can become a little manic and, of course, if it's combined with very lively components elsewhere in the chain the net result may seem a bit much. Frequency response is a bit flat, but we noted that distortion from the unit is not quite as low as we tend to expect these days. It doesn't, however, do anything to disguise the excellent bass, which has a well-judged combination of extension, precision and tunefulness, nor the cleanly extended treble. Detail and imaging are good, though not quite the most astonishing we've ever heard. Overall, this is an attractive and informative bit of hi-fi . We actually found it particularly successful with classical music, which is usually more restrained in tone and doesn't excite the DA100's temperament, but we would certainly recommend lovers of any kind of music to give a try.